Everyone deserves a seat at the solar table. Here’s how to give them one. Access to solar energy has historically been limited to those who could afford to pay or easily finance rooftop systems. This access issue has left a void in the solar industry’s market share and constituency that has been used to undermine progressive solar policies time and time again. 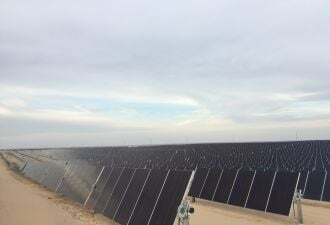 With the nation’s largest solar industry gathering happening in Las Vegas this week, in a state whose solar policies faced just such a fate, the industry has an opportunity -- and an imperative -- to look closely at that void and start developing strategies to address it. In the process, it can rewrite the industry’s narrative around inclusion and equity. Disadvantaged communities and communities of color must identify and pursue every opportunity to enhance their collective well-being. With the impacts of climate change looming, grassroots action is already starting to connect these communities with solar’s economic and environmental benefits while adding their voices into solar policy debates. Witness the innovative leadership of faith-based organizations, which are using their collective economic strength to put solar on their community centers and churches. They have become vocal advocates for the technology, both as an economic and an environmental stewardship issue. Here in Nevada, for example, the REW Ministries faith organizing alliance, a group of 50 churches in the Las Vegas area, is planning two clean energy workshops in October to educate pastors, church leaders, and church members about solar power. 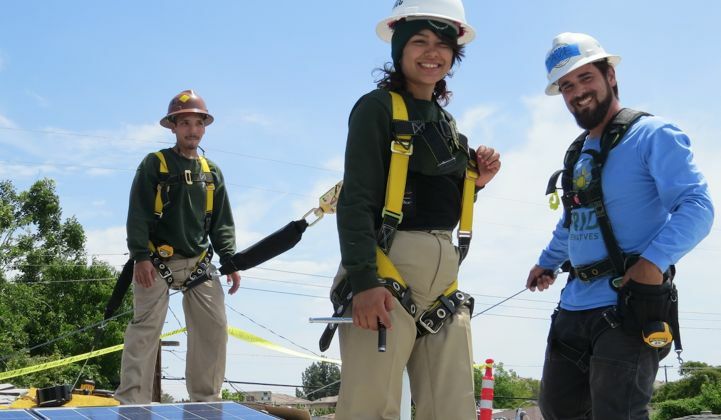 In California, Interfaith Power and Light is partnering with GRID Alternatives to spread the word about solar opportunities for low-income families. Green For All is partnering with Pastor Ambrose Carroll, co-founder of Green The Church, to develop a national network of African-American churches working on the intersection of economic and environmental issues in black communities. Many other community groups are working on these issues as well. In Nevada, the Las Vegas Urban League and the Uplift Foundation are both working to educate low-income families, senior citizens, and African-American youth about the benefits of clean energy and energy efficiency and train advocates around climate change and related issues. The Alliance for Climate Education (ACE) is also working locally and nationally to engage youth in renewable energy advocacy, facilitating leadership around community solar policies in New York; local and state renewable energy targets in North Carolina and Nevada, emissions reductions in Boston; and community choice aggregation in San Francisco. This engagement is training the next generation of organizers -- the ACE Action Fellowship advocacy training program increased public speaking skills 25 percent and petitioning skills 27 percent among youth of color. I witnessed firsthand the powerful impact two of these young peoples’ testimony had during a recent Nevada Public Utilities Commission (PUC) hearing on solar. And CHISPA, a program of the League of Conservation Voters, is organizing Latinos around climate issues and bringing their voices into the policy arena. The group ran a storefront campaign organizing local and small businesses in support of pro-solar action in Nevada, has organized the Latino community to attend Nevada PUC hearings and the Nevada Governor’s New Energy Industry Task Force committee meetings in support of solar access, and are working on other programs to train grassroots leaders. This kind of grassroots leadership on renewable energy is happening all over the country. Imagine the exponentially greater impact these disparate efforts could have if they were coordinated with industry efforts to accomplish a set of shared goals. Direct collaboration with community leaders can provide America’s solar industry with unique perspectives and opportunities to help it reach new consumers, strengthen its position on regulatory issues, and drive economic growth in all our communities. Tap into existing community organizations, especially non-traditional ones like faith-based organizations, civic associations, and fraternities or sororities. Seek out leaders of diverse organizations on the local level to help you get started. Provide more education and data about solar’s benefits to lower-income communities. Work with local organizations to educate customers. Show the real risks and benefits for low-income communities and communities of color, with visible examples. Include diverse voices in decision-making processes. Collaborate with diverse communities when pursuing action in state legislatures, public utility commissions, zoning boards, etc. Invest in building long-term relationships. Don’t limit your interactions to times of crisis when you need support for an issue. Do real outreach, and come into communities ready to listen and learn. Work with diverse communities to design and collaborate on energy programs that have a central focus on energy justice and advocacy training. This approach, based on communication, education, collaboration and investment, will be a win for the solar industry and our communities alike. Everyone deserves a seat at the table and a legitimate opportunity to fully participate in shaping the clean energy future, and when everyone is participating, we will start to make real progress toward realizing that future. Rose McKinney James is managing principal and resident at Energy Works LLC. She served as a commissioner on the Nevada Public Service Commission from 1988 to 1993. She currently serves as board chair for the American Association of Blacks in Energy, and as a member of the board of directors for the Alliance to Save Energy and Energy Foundation.